This is an unedited image of the interesting but unchanging permanent display on my Dell laptop. Apparently, an LCD display can indeed shatter. 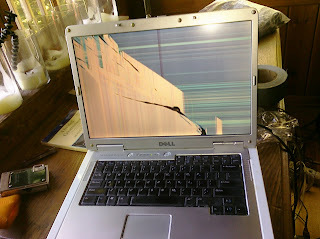 We learned this when Papa picked up my Dell and threw it on the floor in a fit of rage. His anger was triggered while reading the news on my Dell and learning that Armando Galarraga lost his bid for a perfect game due to a blown call by an umpire (see link below). While his reaction was understandable, the loss of the Dell means ShagCam will now be limited to periods of time that the ancient iMac is not being utilized for Skype, sports betting and stock research. Also, blog updates will be limited to Palm Pre posts for the forseeable future. Pics from my camera will have wait until I get back to SF and a working laptop. In the meantime, I am adjusting to life without a laptop. I was happy to see that cleanup of the oil spill is going so well that that Robert Gibbs had time to say the call should be reversed. It is not physically shattered. It appears to be virtually/digitally shattered. Is the Mac screen digitally shatterproof? Yes, good to know the administration have their priorities firmly in place. I smell another White House beer summit! Selig and Galarraga talking it out with the prez over an Escanaba Pail Belgium Ale is exactlly the kind of CHANGE this country needs right now.